As videographers, we get asked to take photos all the time. Even at your wedding, inevitably, there will be a guest that sees us with a camera in our hands and asks us to take a picture. To a guest, a camera is a camera so we gladly capture the moment, and then flag down the actualphotographer to get the shot. Our philosophy on the wedding day is that videography and photography act as a team. Even if we have never met the photographer before your wedding day, our dynamics and ability to work together is crucial toward you feeling comfortable on your wedding day and you getting a final product that you can cherish forever. We are thankful to have had the opportunity to work with some amazing photographers and hope they feel positive about us afterward as well. We typically let the photographer work with the bride to create the timeline but are always happy to chime in and have made our fair share of them as well! Wedding videography and photography work best as a team. Because photography and videography go hand in hand, I read a lot of blogs on trends for photography and often think, “although this is catered toward photo, this is still extremely applicable”. And that’s the point of this blog post today. Our friends at Junebug Weddings posted a fantastic blog about what to look out for when trying to find a cheap photographer. From this point on, every time you read the word “videographer”, know that I’ve put it in the place of the word “photographer” and the message still applies (screenshots are from A Morales Production weddings). Searching for a Cheap Wedding Photo(video)grapher? We’ve Got News for You! We totally get that weddings are expensive and the idea of hiring a cheap wedding videographer sounds like the perfect way to trim your wedding day budget. But, after years of experience in the industry, hearing stories from hundreds of couples and videographers, and planning our own weddings, we’re here to tell you that videography is not the place to skimp! You will be spending so much time, energy, and money making sure every detail is perfect. How disappointing would be to invest so much and walk away with mediocre videos — or worse, no video at all?! Below is from a three part series on Why Your Videographer is not just another vendor, a few things to consider before hiring your friend or family member to do your wedding, and why hiring a free videographer is not all it’s cracked up to be. When you envision your wedding, you probably picture yourself spending time with family, friends, and of course your new spouse. However, there’s two people you actually spend more time with than anyone else on the big day: your photographer and videographer. From getting ready until sparkler send-off, they are with you every step of the way, capturing moments as they pass you in a whirlwind of joy. When you start researching wedding videographers, keep in mind that liking them as a person is just as important as liking their work. Find someone you click with, whether that’s through bonding over Parks and Rec quotes or your mutual love of dogs. During your Skype call or in-person meeting, see if the videographer makes you laugh, makes you comfortable, and makes you inspired. Are you already making plans to grab a drink or see your favorite band together when they come to town next month? That’s a great sign! Hire someone you want to hang out with and that time spent together on your wedding day will be as comfortable and effortless as possible. In addition to liking your videographer, you’ve seriously got to trust them! Trust in your wedding videographer goes beyond knowing they’ll show up on time and deliver your videos according to the contract. It’s so important that you also trust in their process. Trusting that they not only know that you’ll want video of your bridesmaids and of the cake cutting, but that they’re going to capture the real, unscripted moments that are unique to you and your celebration (AKA the video you really want from your wedding day!). While this is likely the first wedding you’ve ever planned, your wedding videographer does this every weekend and knows a thing or two about what to expect. In addition to playing the role of the person who takes your wedding videos, your videographer can also be your biggest advocate throughout the wedding process. Lean on them when it comes to making your wedding day timeline because they know how to get you the best video in the best light and also keep you from feeling stressed, overwhelmed, or tired in the process. You don’t want to feel “over it” on your wedding day, and neither does your videographer — that doesn’t make for very good video! 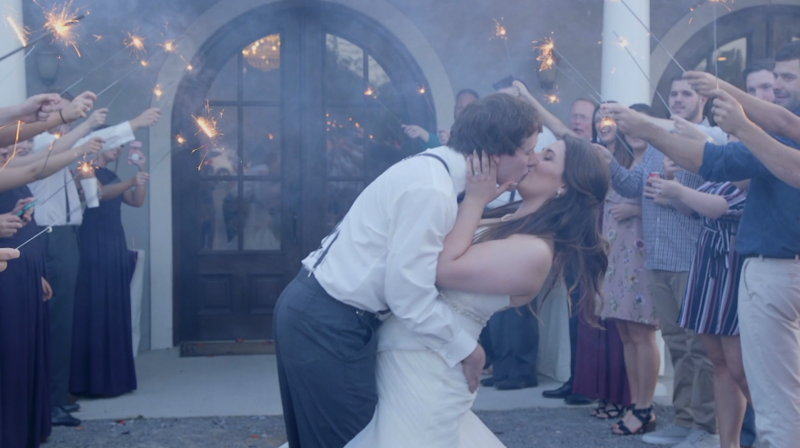 Ultimately, heeding your videographer’s advice only makes the day go more smoothly. Hand in hand with trust comes connection. Those emotional videos you fell in love with in your videographer’s portfolio didn’t just happen out of thin air. 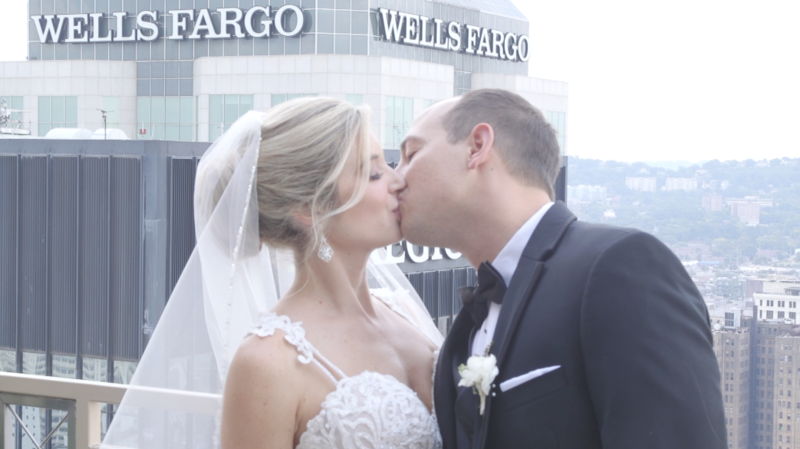 Having a deeper connection with your videographer allows them to capture intimate moments throughout your wedding because you let them see that moment unfold. Part of this connection has to do with trust; trusting your videographer’s process means giving them the space to be an artist. Your videographer wants to create the sort of moments seen in their portfolio of you, but they need for you to let them guide the session to make their vision happen. While all wedding vendors can be considered artists, there’s something different about what videographers create because they are doing so in the moment. They have two people in front of them who are all dressed up and ready to celebrate the most exciting day of their lives and, despite a rapid timeline and minor stressors throughout the wedding, they’re going to create some freakin’ magical art on the spot. While other vendors have months to plan and perfect each detail they contribute to your wedding, your videographer just needs to feel connected to you as possible in order to tap into the “why” of your wedding – the beautiful marriage that’s about to begin, the one-of-a-kind relationship you’ve had up until this point, and the little quirks that make you fall in love with each other more every day. Getting along with your other vendors is important, but the connection you have with your videographer is unparalleled. What a videographer does for their client (that’s you!) 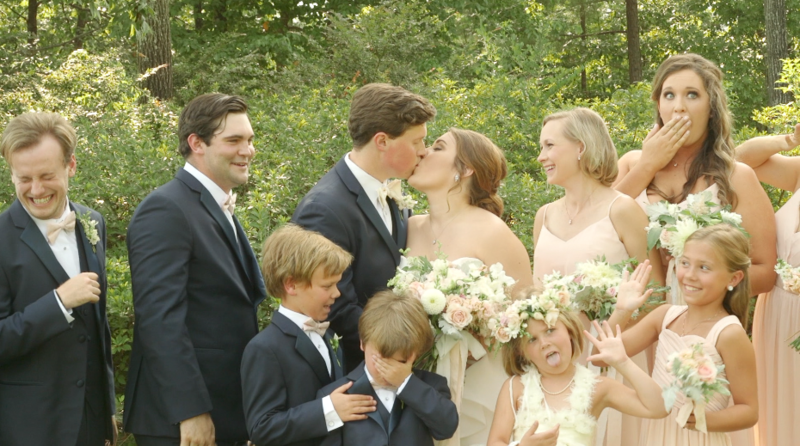 is really twofold: there’s the experience they create leading up to and on your wedding day and then there are the videos they deliver when all is said and done. With the exception of a few iPhone videos your friends and family take during the day, your wedding videographer’s videos are all that you have to remember your wedding by. No matter how much you spend on flowers, food, or fabulous reception chairs, the one thing you get to keep is your videos. When you look through your wedding video, you’ll be able to remember it all: the songs that played while you danced for the first time as a married couple, the look your bridesmaids gave you when they saw you in your dress for the first time, the tears in your partner’s eyes (and yours too!) as they spoke their vows aloud at the altar. Your wedding videographer is able to give you something that other vendors just can’t, and that’s ultimately why investing in someone whose work you believe in and who you’d totally hang out with in real life is worth it. First and foremost, if your friend has not done a wedding before, making yours the first may not be the best idea. Even if they are an event planner outside of the realm of weddings or they’re a hobby videographer, a wedding is a totally unique experience they may not be prepared for. You deserve to have an experienced professional taking care of the details without causing you any unnecessary stress. A well-versed wedding vendor knows how to handle the kinds of unexpected circumstances that come with weddings and are skilled in making moves you don’t even know are happening behind the scenes to keep things running smoothly. This consideration may not seem like a big deal, but it really comes down to respect. If your friend is a professional in their field, then this is their livelihood and they’ve got bills to pay! Expecting a discount or even free services is awfully presumptuous and can make your friend feel as though you don’t value their time or talent. Before contacting your friend simply because they make a living as a videographer or florist, look at their portfolio as if you didn’t know them personally and see if their work is truly a fit. Is their style what you envision for your day? Be sure to genuinely look into other vendors in your area as well to make sure your friend’s work is really what you want, that way no one feels any disappointment when everything is said and done. While it’s normal to wonder why wedding videography has such a steep price tag, there are actually several factors built into the cost – all of them meant to benefit you! Perhaps the more obvious reasons a videographer charges what they do has to do with the value of their knowledge and skill, as well as the cost of their equipment and programs that help them capture your day in the first place. However, the cost of services also includes things like insurance for their gear and even liability insurance should something happen to them or you during the shoot. Booking a free videographer can leave you vulnerable if something were to happen, whether that be the videographer’s gear getting stolen or broken before your wedding or, goodness forbid, something happening to the videographer themselves. Being a professional is more than just talent and experience – it’s being prepared and accountable for any number of situations. When it comes to your wedding, it only happens once! There’s no re-doing a first look, first kiss, or first dance. If your videographer doesn’t have experience capturing weddings, specifically, they’re more likely to become flustered by the quick timeline and crowd of people, be unaware of where they need to stand to get the shot, or forget completely about getting an moment you definitely want from your day. Your mom’s friend with a nice camera or your college roommate who films beautiful landscapes as a hobby simply aren’t experienced in the unique and fast-paced world of capturing a wedding. It’s awesome for this person to want to gain that experience, but being the sole person in charge of documenting some of the most special moments of your life may not be the time or place. Anytime money changes hands, the situation becomes more serious. Seeing as this is your wedding day, each service hired should be taken seriously! With no money involved, your free videographer isn’t necessarily held to a standard, whether that be a certain level of work or even that you receive your images (and in a timely manner!). With a professional videographer, you are making a payment for an exchange of services, and the videographer is contractually obligated to perform and deliver! In order for someone to hold up their end of the deal, there has to be a deal made! Otherwise, who says your free videographer has to deliver your images, whether that’s in the next six weeks, this year, or ever. Your payment goes beyond setting expectations and adds another sense of legitimacy to the equation that, again, protects you! You’ve heard the phrase before – “you get what you pay for.” When you think about your wedding day, your focus may initially be on where it takes place, who attends, and what’s for dinner. However, once the rentals have been returned and the dress has been stored, all you have to relive your wedding by are the videos. You want to cherish your wedding videos for years to come, not get a bad feeling in your stomach about every time you remember what’s missing or what could have been. 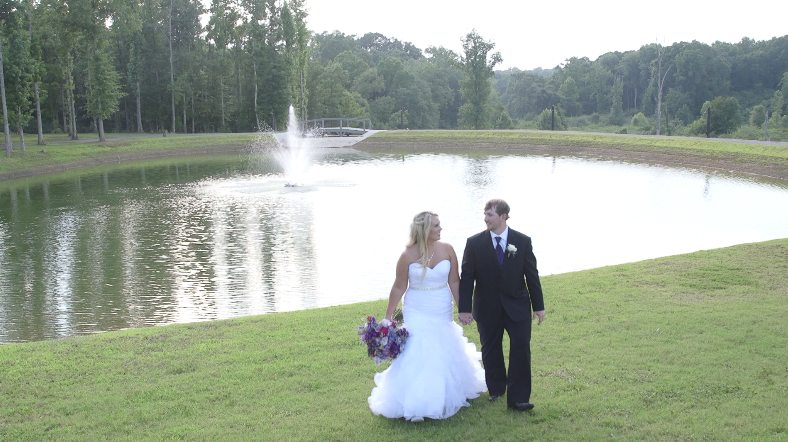 Wedding videography is a job that encompasses so many unique skills. Not only are they keenly aware of exactly what needs to happen in documenting your wedding on the big day, but they have abilities to turn what’s in the camera into art after the fact using a variety of post-production processes. A video can be beautifully composed straight out of the camera and still require more work to create videos you will be able to use and show off. Here’s a little food for thought for you: would you trust your brother’s friend to fix your engine if he isn’t a mechanic, but has a nice toolset? What about letting your childhood friend perform minor surgery if they went to school for marketing, but they want to contribute to your healing process? Our guess is probably not. Just like with any other service, invest in a wedding videographer you trust, not only to nail every moment, but to be prepared, responsible, and professional – because it’s worth it!